We awoke at 7am, which was later than our alarm time of 6am. 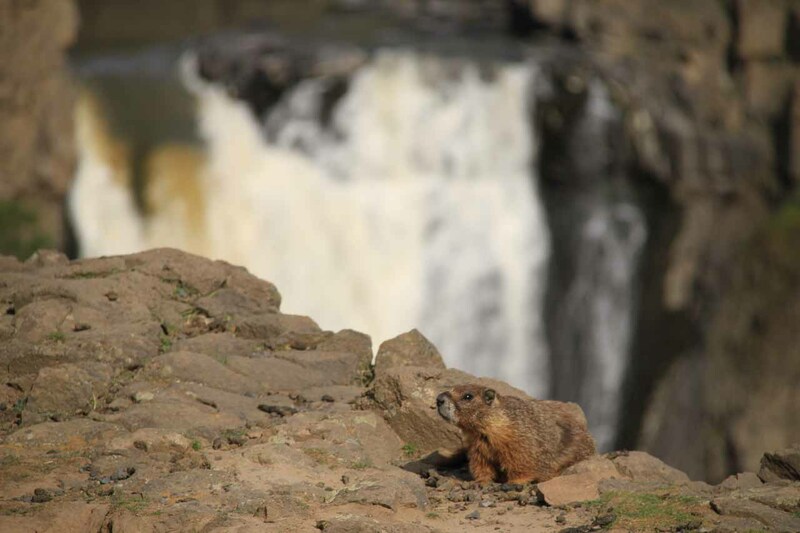 We decided to sleep in on this day since we knew the only waterfall excursion was Palouse Falls as we were headed west into the Pacific Time Zone through Oregon and eventually to southeast Washington. We figured there was no rush. Besides, my stomach wasn’t feeling terribly well since yesterday we over-ate at Epi’s. And on this morning, I certainly felt like I paid for it. As I was busy getting caught up on writing yesterday’s travel entry, Julie was actually finished packing and was ready to go well before I was done doing my errands. That was kind of rare as usually I would be loading up the car while she was still getting ready for the day. Anyways, we’d eventually be out the door at 9:20am. Our late departure time was a bit unusual for us since we’d usually be out the door at least an hour or so earlier than this. But we appreciated the recovery time. Now, we were headed west on the I-84, and we knew that it was going to be a long drive. Within an hour of driving, we left the state of Idaho and entered the state of Oregon. It was noteworthy that we had also crossed into the Pacific time zone (as indicated by one of the signs by the state border), which meant that we had just fallen back by one hour. 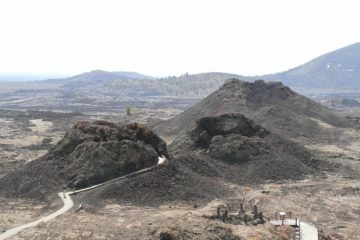 Much of the scenery was still brown as we were still within the Snake River basin. After nearly 90 minutes of driving, we found ourselves in Baker City. We thought we might try to have an early lunch here at the bar that Steve at the airport suggested we try, but after Yelping that particular place, we learned that they wouldn’t be open until 4pm. Since there would be no way we’d be staying in Baker City until then, we just kept going. As we left Baker City, the scenery was still brown around us with some long sprawled out farms adding some contrast to the monotone with some green pastures thanks to the irrigation. There were snow-capped mountains in the distance on both sides of us, and if we had time to stop, we easily could have taken some landscape photos. But zooming along the I-84 just didn’t make it seem like a wise thing to do. Before long, the road started climbing some more and we found ourselves on the Columbia Plateau. What made this part of the drive striking to us was that we saw more green! In fact, we were surrounded by pine trees or something like that, which suggested that this area probably tended to get snow. Fortunately for us, the snow stayed on the mountaintops and away from the interstate. At about 12pm (PST), we finally crossed out of Oregon and into the state of Washington at the town of Walla Walla. What surprised both of us was that Walla Walla was actually a pretty large town. It was said to be historic (established in 1856, I think) and its downtown area seemed to have that bit of a mix of historic charm with modern development. Still, we had expected the town to be a sleepy backwater, but this place felt young and vibrant (was there a college here?) and it shattered our perception of this seemingly out-of-the-way part of the state. Julie had yelped for a lunch spot in town, and we decided on going to this sandwich place called Graze. So at 12:20pm (PST), we were parked close to the front of the place and we saw that there was a line that almost went out the door. Clearly this place must’ve had a bit of a reputation. As we exited the car, we noticed right away that it was pretty warm. Indeed, it was over 80F, which I would imagine might have been unusual for a late April day in this part of the Pacific Northwest. When we lined up, placed our order, and got our sandwiches (I think we got a flank steak torta and a grilled turkey with pear panini), we could totally see why the place was as popular as it was. Julie said it was way better than Panera. Moreover, we felt less guilty about our meal here than at any time we were dining in Southern Idaho so far. 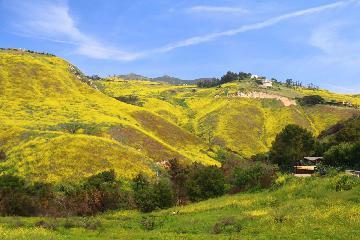 At 1pm (PST), we were fully satisfied with our lunch and continued driving a short distance to our accommodation. Five minutes later, we were there, but the America’s Best Value Inn here was definitely a cheap motel that was a far cry from the chic La Quinta we stayed at earlier this morning (though it actually costed more than La Quinta in Meridien possibly due to location). Nonetheless, Julie picked this place because it was way cheaper than most of the other places in town that received good reviews. There was no way we’d spend $161 for the night when we could’ve paid less than $100. 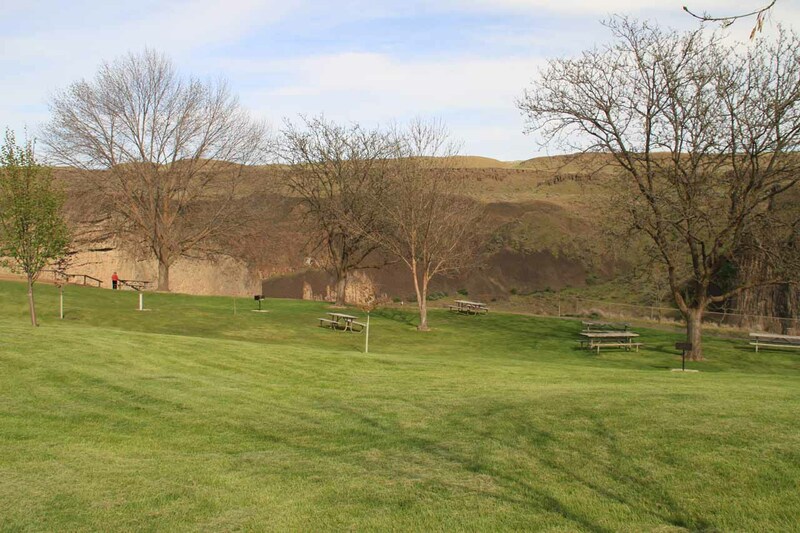 However, we couldn’t figure out why Walla Walla was so expensive, but then again, it might have had something to do with the history of the place (was it a tourist attraction?) or perhaps it was close to a wine region or something. 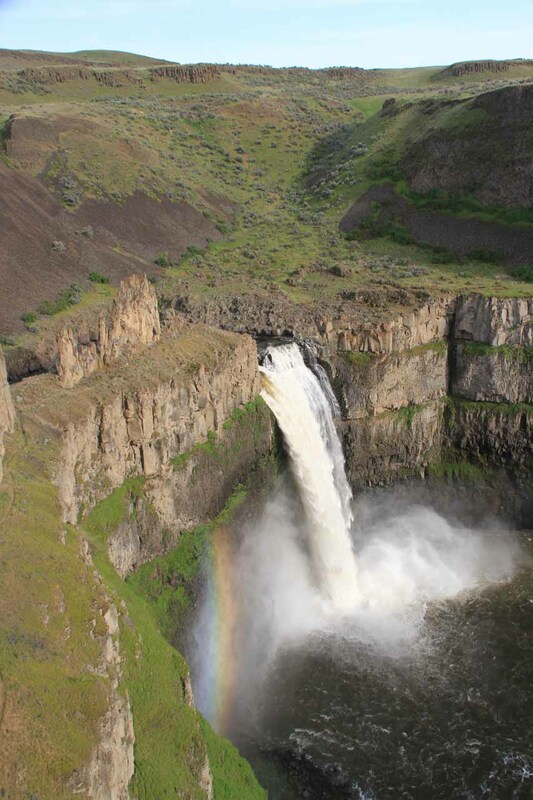 After dropping off our bags at the “sleep eazy” motel, we got back into the car and proceeded to drive towards our lone waterfalling excursion of the day to Palouse Falls. We took off at about 1:35pm (PST). It took a little bit of time to get out of town because I had to fill up gas, but then we were off. 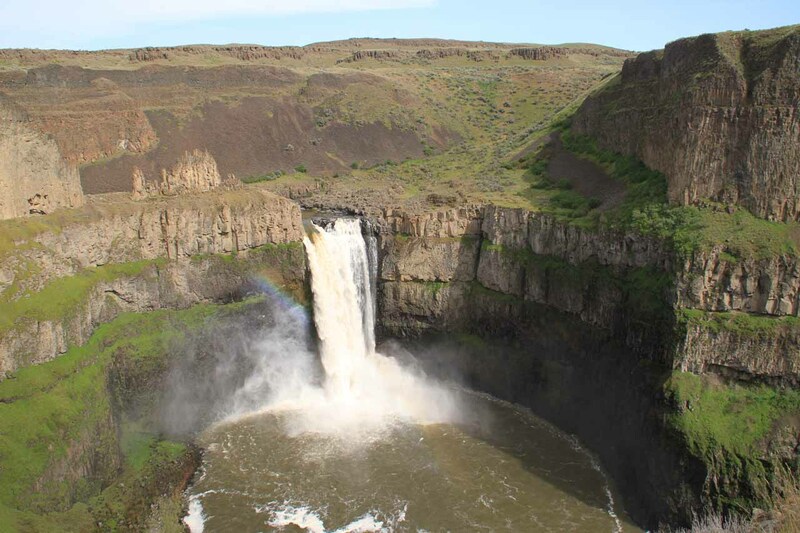 The GPS wanted us to take some direct route on some rural road, but we opted instead to take the Hwy 12 and then the Hwy 261 to Palouse Falls State Park. While most of the highways were only two lanes going in opposite directions (so we frequently found ourselves behind slow pokes or trucks until it was safe to pass or we had a passing lane), we were making pretty good progress as it was typically 60mph speeds with a few 25mph zones when we passed through some sleepy towns. One of the towns we passed through when we got onto the Hwy 261 was a place called Starbuck. We speculated whether this place had any correlation to the famous Starbucks coffee brand, and so when we were in front of one of the Starbuck welcome signs at 2:55pm (PST), Julie went ahead and took a photo on her iPhone. 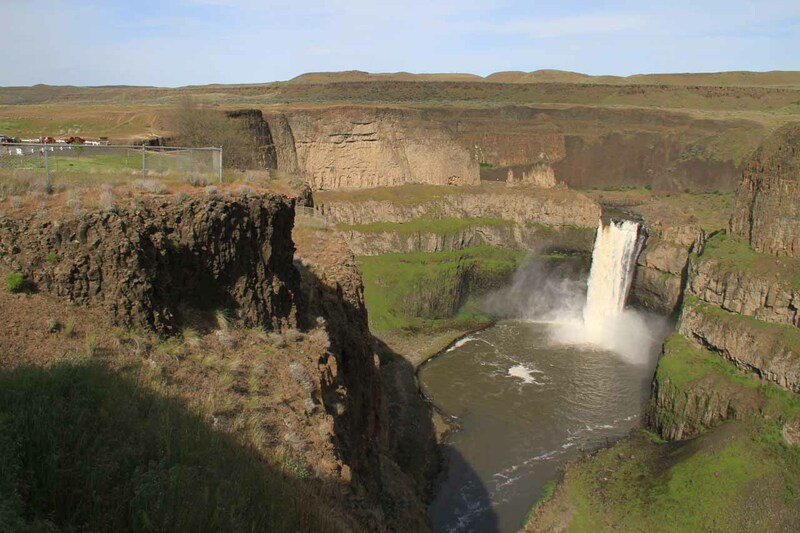 Eventually at 3:15pm, we would arrive at the Palouse Falls State Park after driving the last 2.3 miles on unpaved roads. Still, this park was pretty busy with visitors, and it was for good reason because we could hear the thundering rush of water as soon as we had got out of the car. I was a little nervous about not paying the $10 fee, but we were one day before the National Park week being celebrated at this park, which would’ve meant we would be exempt from fees. The $10 fee was pretty steep for a quick visit here, and I wondered if it was really meant more for people camping here since we hardly saw anyone drop money into the fee envelope drop slot. Julie and I promptly went down the steps where at its bottom was the fenced off overlook. 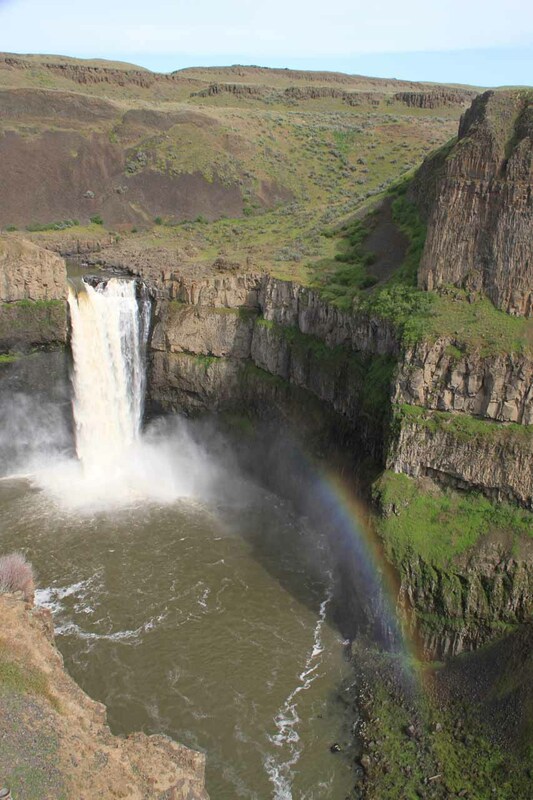 And right before us was the thundering Palouse Falls with a rainbow! Right off the bat, our first impressions of the falls were that it was awesome. But then the surrounding scenery started to further augment our impression of the falls as the gorge and hills above the canyon rims were reminiscent of the raw naturesque locales we saw in Iceland. So we took our time taking what photos that we could including a few awkward couple shots using the tripod and camera timer. 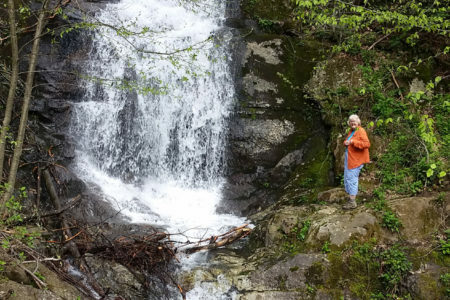 And so when Julie had her fill of the falls, she went back to the car park area to read her Kindle. 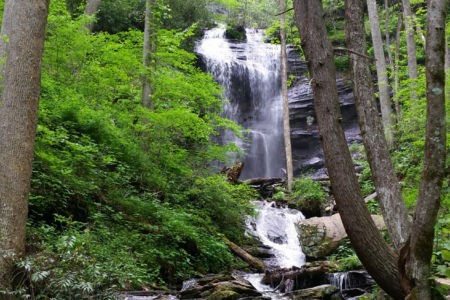 Meanwhile, I was slowly checking out every conceivable overlook that I could find to get as many looks, photos, and movies of the awesome falls as possible. I recalled passing by a locked gate that looked like a legitimate trail, but since it was locked, I decided not to hop it so I had no idea where else the trail would go. I ultimately went as far right as this sheltered overlook called Fryxell Overlook. Apparently, there was a major archaelogical find by the person for whom the overlook was named after, and it was said to have dated back a thousand or more years ago (I forget). When I had my fill of this spot, I then proceeded to follow a gravel path that also left the main car park area. This gravel path would eventually lead me to a steep descent onto some railroad tracks. 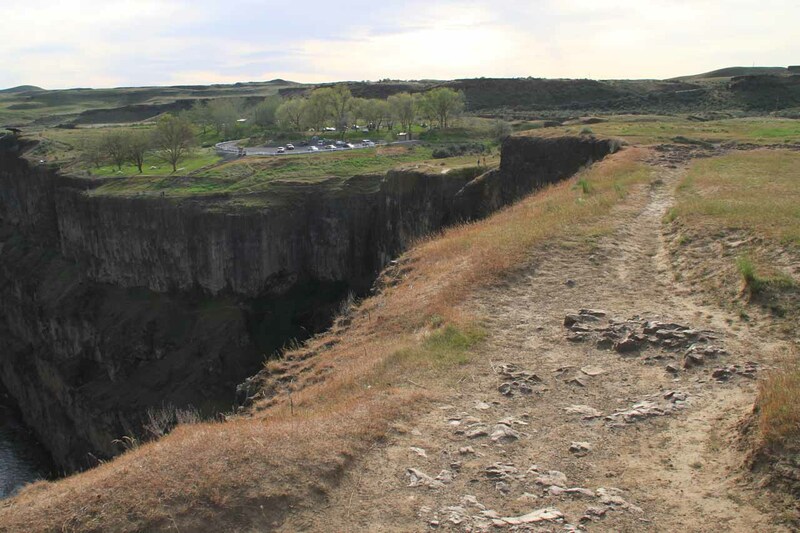 Then, the descent would continue below the railroad, where I’d eventually get to the Upper Palouse Falls. 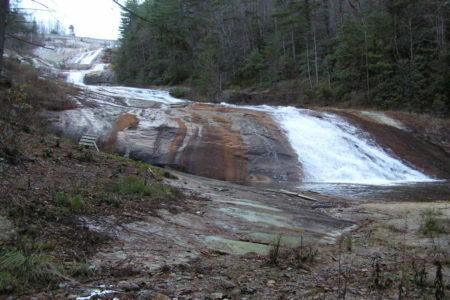 This particular waterfall was more of a wide and short river waterfall, but it was backed by an attractive butte. 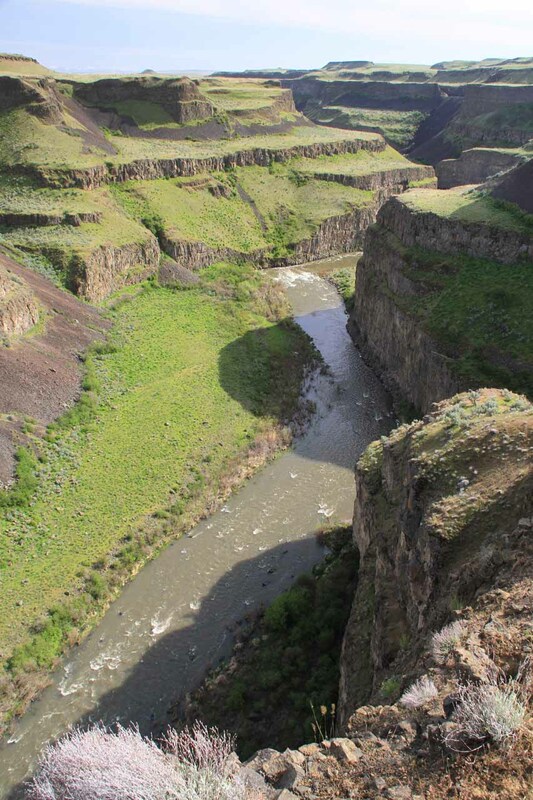 I then continued on a faint path that went along a ledge hugging graffiti-laced cliff walls while elevated above the Palouse River. 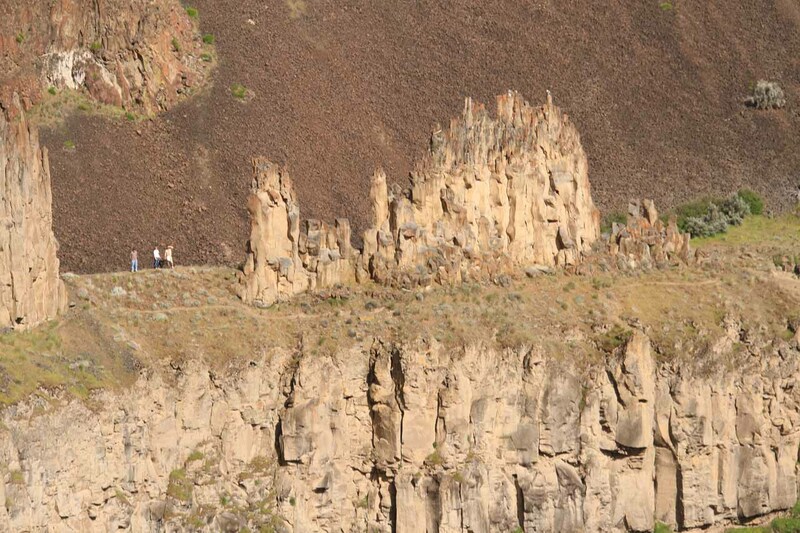 Within a few minutes, I made it right to the “mohawk” (as one couple said whom I conversed with briefly while doing this hike), which was perched right above the main Palouse Falls. However, the view from this spot was a bit dodgy as only part of the falls could be seen. The slope of this section was such that I didn’t want to get too close to the edge (even though I knew I might get much better views from there). Still, I’m sure I must’ve been someone else’s photo subject from the main overlook area by the car park. So I headed back up and managed to briefly converse with another couple who were hiking in flip flops. 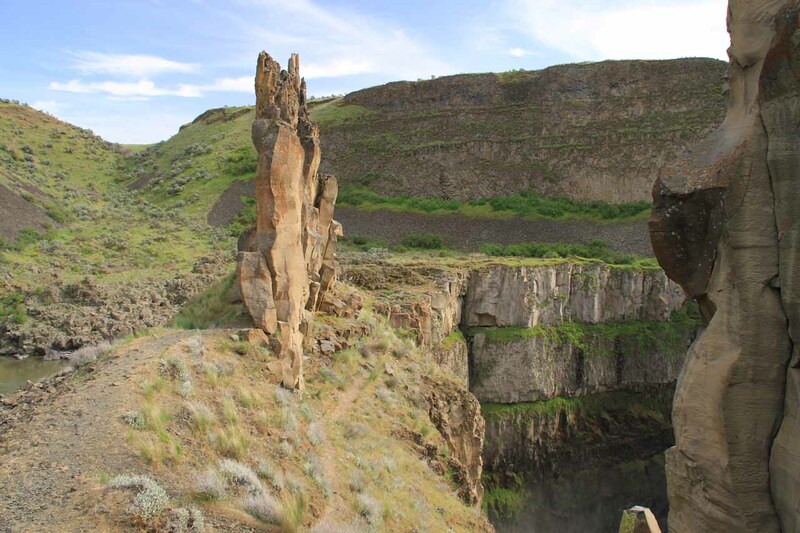 They told me that they actually went to the bottom of the main Palouse Falls, and when I inquired about that, they said that they actually hopped that locked gate that I had noted earlier. They then said that it wasn’t an easy hike because they had to hug a ledge that was sandwiched between two cliffs. And from looking across the canyon from the mohawk or pinnacles or whatever that thing was above the falls, that ledge path sure looked like it was full of risk. 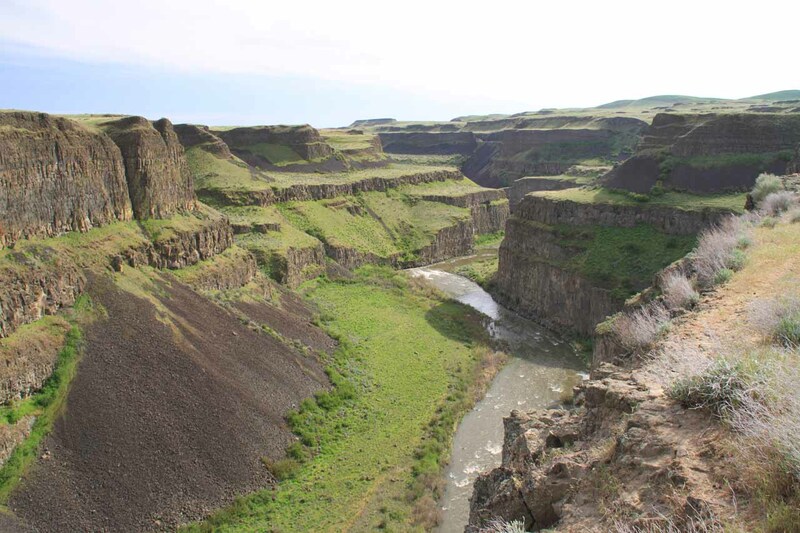 Anyways, when I went back up to the top of the gorge, I skirted the gorge rim in search of more overlooks where I had hoped to photograph both Palouse Falls as well as the canyon further downstream. I’d eventually get to a very precarious corner where that might have been the spot to get both the falls and the canyon downstream, but the problem was that my lens didn’t have a wide enough angle. There was another couple that was here, and they managed to get to the precarious corner in flip flops. I didn’t know what the deal was with people doing these risky scrambles in flip flops, but at least this guy said he didn’t come prepared as he didn’t expect there to be any hiking here until he saw the trails. After getting my fill of this corner view, I then proceeded to walk back towards the car park, but not before seeing another pretty cool view right on another protrusion. This time, I was able to see a rainbow again that appeared to arc directly beneath the mohawk. Finally at about 5:40pm (PST), I was back at the car to rejoin Julie. She wasn’t too happy with me going by the mohawk as she said she saw me from her vantage point. Indeed, she realized that the excursion I went on was that hike that Steve from Boise whom we met at LAX had told us about. 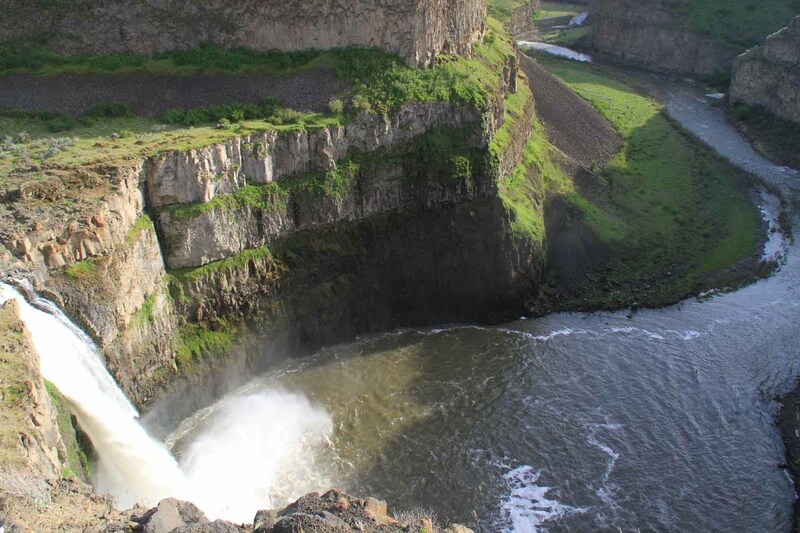 So after having some fruits and water to quench our thirst from this rather dry place, we would finally leave Palouse Falls State Park at 5:55pm (PST). We’d eventually make it all the back to Walla Walla at 7:20pm (PST), where I finally had time to shower and wash off the dust and sweat I had accumulated at Palouse Falls. We’d eventually go back into town at 8:15pm (PST) or so, and we ate at this place called Saffron, which promised to be something quite different from all the meals we had had earlier on this trip. This was supposed to be some kind of Mediterranean fusion, but it turned out that this food was inventive and quite good. We had foie gras, burgundy snails in Moroccan tea, quail, and Oregon flank steak with some interesting toppings as well as sticky date for dessert. This was probably the best dining experience we had so far on this trip. 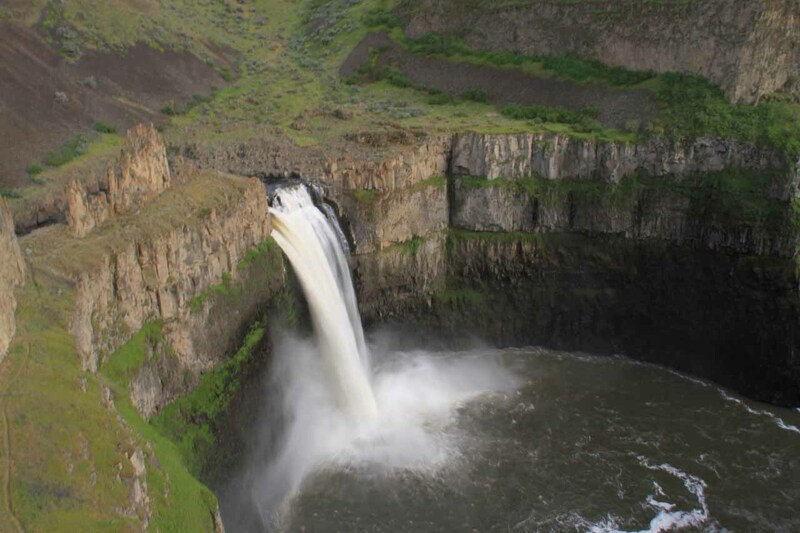 In fact, when Julie and I were comparing Palouse Falls to the earlier waterfalls we had seen in Idaho (especially Shoshone Falls), we came to the conclusion that even though this was supposed to be an Idaho trip, it was Washington that stole the show. Indeed, the restaurant here in Walla Walla plus the lunch place was easily the best food we had on this trip. 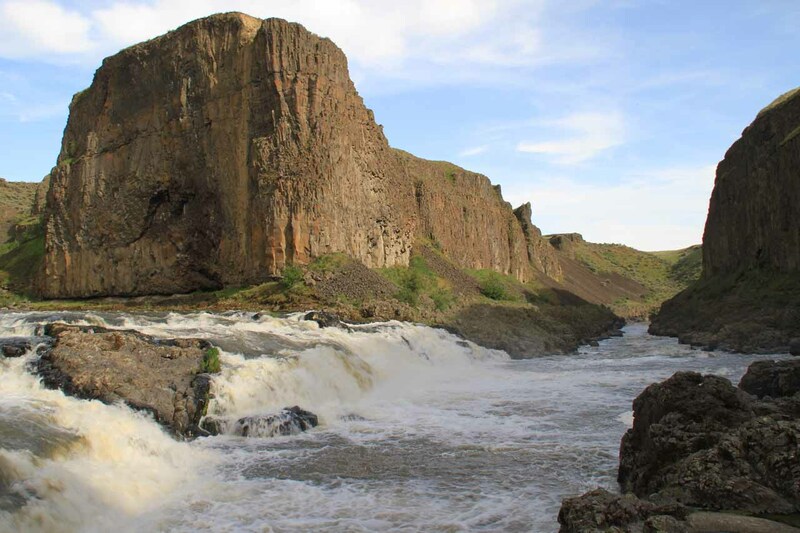 Then, the waterfall itself outshone Shoshone Falls, especially considering it was very raw and naturesque (as it was supposed to be). So as we were fully satisfied and not overstuffed from this dinner, we came back to our room at around 9:45pm (PST) and finally called it a day. This would conclude our waterfalling on this trip as there would be no waterfalling tomorrow. Indeed, Saturday would be all about catching up with one of Julie’s good friends in Boise. And the day after, we’d finally get to see our daughter once again.